Whether they're made of wood or steel, plastic, glass, or any combination of these, you need pharmacy shelves to display the merchandise you have available, to keep your store neat and tidy, and to organize your inventory. However, pharmacy fixtures aren't just about functionality. 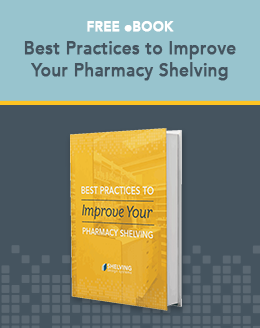 The first thing you should consider when you think of pharmacy shelves is to make sure your merchandise is organized properly so that you can find it in the stock room – and on the retail floor -- so that your customers won't have trouble finding what they need, either. If you use bland institutional fixtures and shelving, you will take care of your organizational needs but your sales may actually suffer. 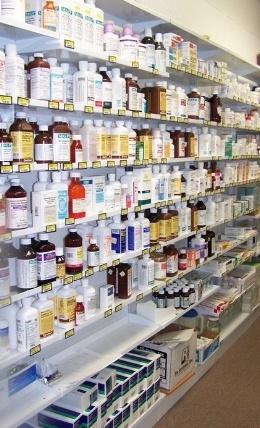 You make your displays pop if you focus on making your pharmacy fixtures as visually pleasing as possible. They become part of the display, accenting and presenting your merchandise in such a way that customers will be attracted to, and then want to buy it. No matter how attractive or enticing the product itself may be, you'll blunt that attractiveness unless you make the backdrop – the shelving and fixtures – as esthetically pleasing as possible, too. Don't mistake institutional or bland shelving for the perfect backdrop. You may think that bland shelving will simply fade away so that the merchandise itself can shine, but what will really happen is that the bland fixtures will deaden the look of the merchandise and make it less, not more, attractive. When you utilize truly attractive drugstore shelves that set off, present, or complement the merchandise you have displayed, you make the product itself more enticing. Drugstore fixtures do more than just display merchandise. They actually help create the overall atmosphere of your store. You want your pharmacy to be inviting to your customers, right? Then, focus on making your environment inviting, not institutional. Use drugstore fixtures that will blend in or complement your decor. Use fixtures made of wood, painted metal, glass, or carefully molded plastic. Mix and match to create an atmosphere that is entirely yours. Your fixtures can support your "brand"
What's your brand? It's the look, logo, color scheme, and name that evokes images of you in your customers' minds when they think of it. Drugstore shelves can be one more element that will support and help you present your overall branding. Choose fixtures that complement or match your brand's colors. When customers walk into your store, they will know that your pharmacy is "you." Utilize drugstore fixtures as a means to make yourself a fixture – in your community. When your customers recognize you in your overall branding, they'll think of you when they need your merchandise and/or services. Your drugstore fixtures can make or break not just your product displays, but also the overall atmosphere in your store and even your brand. Choose carefully; don't just settle for institutional or bland fixtures thinking that your merchandise can shine more brightly thanks to a colorless or boring backdrop. Instead, incorporate the look of your fixtures into your displays, your decor, and your brand, too. Your customers will remember you and your store, and will reward you with their business as a result.